Yes I'm a huge fan of this trend and wear colored tights in winter! I think is an ideal way to add color to your look!! 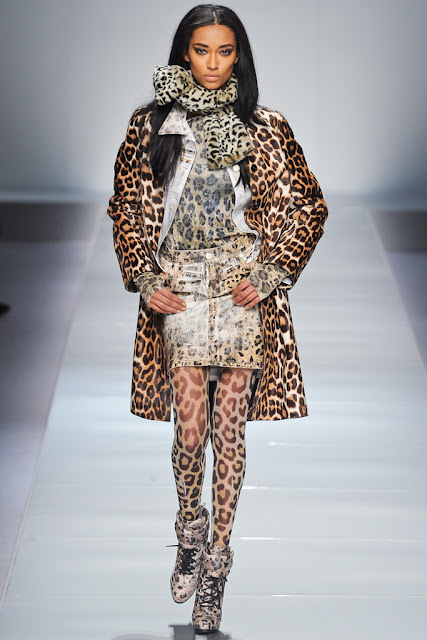 Adore this trend, the burgundy and leopard print tights immediately caught my eye, great runway inspiration! Haven't tried this out yet but I think it's a fun trend! Colored and patterned tights are a really cool and fun way to infuse some interesting texture or hue into your look! I'm not bold enough to try out colors other than gray or black, but I really love the whole feel of it. Thanks for posting such inspirational photos! I LOVE this trend!! It makes dressing in cold weather more fun! Absolutely love this trend, especially the patterned tights! I really love these differents colors and i love these trend too. It's a very nive selection. i love colored tights! I bought some yellow ones at the end of the year last year and am excited to wear them! I adore colored tights and own many pairs myself! So fun! Love these looks! Ehhhh I don't know. Something about coloured tights makes me think of the days when I was 6 years old. They're not bad but it could just be that I don't like tights in general. They generally make me feel like my legs are short and stubby...I always wear black or smoke gray sheer hose. Now those patterned ones I may be game. What a great post! I really love the leopard one! I love all the pictures! great inspirations! i think it'sa bit challenging to make colorful tights look classy!so thanks for the inspiration! I don't know what it is about tights, but I'm always a sucker for them!! You know how there are some categories of clothes that you find yourself always looking at online or in the stores? I always want more tights! I've never worn solid bright color tights - always want to, but usually I'm afraid. But when I see them like here in this post, I adore!! I'm loving those leopard print tights too... may want to start wearing more daring tights! I love yours, and of course I wanna follow you. I already follow you on GFC. I like this trend! Nice blog, perhaps we can follow each other? Love the focus on tights. Honestly, this is an area of my wardrobe I need to expand. I'm inspired. Thank you for your kind comment. I'm your newest follower on both GFC and bloglovin. In fact, I showed lots of love on many of your wonderful posts. Hope you'll do the same. That shade of purple is beautiful - I want them!